Pristina (also written Prishtina) is not often regarded as a very photogenic city. It certainly doesn’t have the glamor of Paris or Prague, but it has a funky, gritty spirit of its own. Pristina is all about funky cafés and bars, offbeat bazaars, street art, and tiny details. Its streets may not instantly scream “Instagrammable,” but look beyond and you’ll be surprised at how charming the city can truly be. The best brunch place in Pristina, if not all of Kosovo, you have to visit Dit’ e Nat’ at one point during your trip to Pristina. 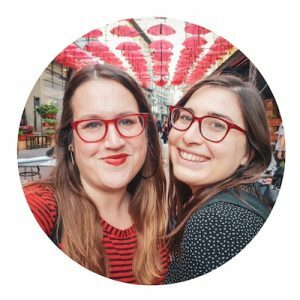 It’s a great place to get a gorgeous breakfast photo (get your flat lay skills on point! ), or just to get a good selfie on the funky DIY-vibe terrace. It also has a bookstore section that is very photogenic! At night, this is one of the best nightlife spots in the city, but by day Soma Book Station is one of the most gorgeous Instagram places in Pristina! This hybrid library/restaurant/café/bar is one of my favorite photography spots in Pristina, and you definitely shouldn’t miss it when in the city. Is it weird to include a building that’s often shortlisted as one of the ‘ugliest buildings in the world’ on a list of Instagram-worthy places in Pristina? I can’t help it – Brutalist architecture makes my heart skip a beat! If you like to feature the offbeat side of the cities you visit, especially in a place that’s not as traditionally “Instagrammable” as Pristina, you can’t miss the National Library. As funky and weird as the exterior of the National Library is, the inside is equally photogenic and worth a visit! It’s a huge difference from the outside and it could be interesting to show the contrast between exterior and interior on your Instagram feed. With exposed brick, hanging plants, and mismatched furniture, Half&Half on Nënë Tereza Boulevard looks almost straight out of Brooklyn (luckily their prices are not!). It’s located right on the main pedestrian walking street of Pristina so it’s a great place to people-watch as well as snap some photos. One of the most quintessential photos you can take in Pristina, you can’t miss snapping the “Newborn” monument. Erected in 2008 on the day that Kosovo declared independence from Serbia, this monument (which changes its colors and theme every year) is an in-your-face assertion of Kosovar independence and identity. 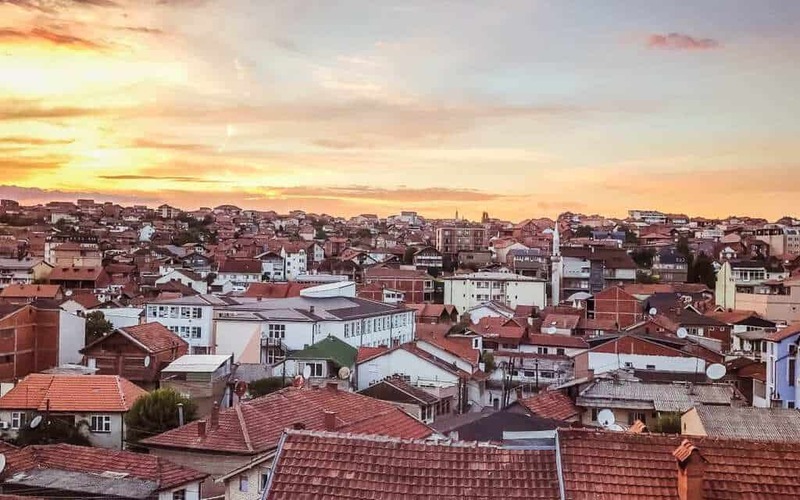 We love the view of Pristina at night with those red-tiled rooftops against the sunset! This was taken at Stephanie’s hotel room at the Hotel Sara during her stay in Pristina, but if your hotel doesn’t have a nice view, head to the Cathedral of Saint Mother Teresa and take the elevator up to the top for 1 euro, which will give you some stunning views! Headed to Pristina? We have some great travel resources to help you with your trip. You can check out our list of the best things to do in Pristina. We also have a Balkan currency guide which explains how money works in Kosovo and local tipping customs. Get Travel Insurance Before You Come to Kosovo! Make sure you have travel insurance before you come to Kosovo. This part of the world is safe, and we absolutely love traveling here! But things happen on the road, and having travel insurance keeps incidents from ruining your trip. Recently my aunt fell on a train in France and needed surgery, but luckily her travel insurance covered the costs in full. Thank goodness!